>> We’ve just posted a new video blog I did on the crises in Egypt and Jordan at www.joshuafund.net. >> MONDAY: I’m scheduled to be interviewed today on Fox News Channel with Neil Cavuto around 4:20pm eastern re: Egypt. Also, Janet Parshall has asked me to be on her radio show at 6:30pm eastern to discuss Egypt. Subject to change. Please check back for updates. In the past several days, the dynamic of the protests in Egypt has changed rapidly, and not for the better. What started out as a genuine and positive pro-freedom movement is being steadily coopted by the Muslim Brotherhood and other violent and extremist forces. There is now a growing risk that the overthrow of the Mubarak regime could lead either to an authoritarian military regime, or a Radical Islamist regime. We must pray neither scenario comes to pass. The people of Egypt would be further oppressed. The U.S., Israel and the West would be endangered. Bottom line: This is a very complex and fast-moving crisis, and it could get much worse. Let me explain and put the situation in some context. The Radicals are extremist Muslims who want to overthrow every regime from North Africa to the Middle East to Central Asia and replace them with Islamist dictatorships who believe that “Islam is the answer and jihad is the way.” These include groups such as al Qaeda, Iranian Twelvers, Muslim Brotherhood, Hamas, Hezbollah, and the like. The Revivalists are former Muslims who say, “Islam is not the answer, jihad is not the way, Jesus is the way — and the only way for our part of the world to move forward and make real and lasting social, economic and spiritual progress is to skip back in our history before Islam and revive what we once had: first century, New Testament, Biblical Christianity.” These followers of Jesus Christ in the Islamic world tend to be apolitical and are focused on evangelism, discipleship, church planting, pastor training and spiritual renewal. By using dual strategies of an air war (satellite TV, radio and the Internet) and a ground war (especially the house church movement), their numbers have swelled into the millions since 1979, despite widespread (and recently intensifying) persecution. I profile a number of their leaders in the book, though few of them are known by name in the West. These first three are the revolutionary forces in the region, people and movements who advocate and push for dramatic, sweeping change. The Resisters tend to be secular Arab nationalist leaders who oppose significant change of almost any kind. They may be Muslims but they certainly aren’t revolutionaries. They don’t want to build an Islamic empire. They want to build their own empires. They want to hold onto the power, wealth and prestige that they currently have, and gain more if they can. They strongly oppose revolutionary movements of all kinds. Egyptian President Hosni Mubarak is a classic Resister. So are leaders like Syrian President Bashar Assad, Libyan leader Moammar Ghadaffi, the leaders of Saudi Arabia, and so forth. Previously, Saddam Hussein fell into this camp. Finally, and most importantly, are the Rank-and-File — these are the billion-plus everyday Muslims citizens who work hard, play by the rules, are trying to find decent jobs to feed and educate their families. They aren’t revolutionaries. They long for more freedom and opportunity, but mainly they keep their heads down and try not to be noticed and not be interfered with. They are the audience to which the revolutionaries are playing. They are watching the battle between the Radicals and the Reformers, and they are increasingly curious about the message of the Revivalists. And some of them are making their move and joining one of the revolutionary movements. That said, let’s focus again on the crisis at hand. What we are witnessing in Egypt is an historic clash between true Reformer Muslims who want free elections and free markets, and Radical Muslims who want to use the protests to overthrow the Mubarak regime and install a violent, extremist Islamist government. The Revivalists in Egypt are, for the most part, staying underground. True to their nature, they are remaining apolitical and are devoting themselves to much prayer for the future of their country and the souls of their friends and neighbors. For the first first few days of last week, most of the initial protestors on the streets of Egypt were peaceful, respectful, somewhat educated, and poor to middle class. I believe they were genuinely calling for an end to the Mubarak regime’s corruption and authoritarian rule in order to achieve more freedom, more opportunity, a better economy, more and better jobs, and a democratic government that would respect and protect their human rights and civil rights and set them free from the stagnant, stultified, oppressive Egyptian system they have suffered under for so long. However, beginning on Thursday and accelerating throughout the day on Friday, the situation began to change dramatically. These are not the actions of a true pro-freedom movement. Almost none of this happened last summer when millions of Iranians took to the streets to protest the fraudulent re-election of Mahmoud Ahmadinejad. To the contrary, the Iranian people, to their great credit, initiated what was overwhelming a classic non-violent, principled protest movement against the Radical regime. President Mubarak’s response to the protests has been badly overdone and typically authoritarian — shutting down the Internet, blocking social media like Facebook and Twitter, and now blocking even the Al Jazeera satellite TV network. What’s more, the police and army at times have been thuggish and brutal (though not always; their have been fascinating reports of policemen and soldiers embracing the protestors, encouraging them even). So I find myself in a quandary. I strongly support the right of the Egyptian people to have free elections and free markets and true opportunity in the 21st century. What’s more, I want the Church to be free to share the gospel and win Muslims to faith in Jesus Christ, make disciples and plant new congregations without government oppression and without violent attacks by Radical Muslims. I do believe Mubarak has stayed too long. He has not responded to the yearning of the Egyptian people to be free. His day is coming to an end. That said, however, I don’t want to see the Muslim Brotherhood win. For all of Mubarak’s sins, he is not a Radical. He doesn’t want to launch a jihad against the U.S., Israel or the West. He has maintained the peace treaty with Israel. He has worked to counter the Hamas movement in Gaza. He is strongly opposed to the Iranian nuclear weapons program and has worked closely with the West to counter it. The Obama administration needs to be careful to support positive change in Egypt and support human rights there, without cutting the legs out from underneath Mubarak precipitously, the way President Carter did to the Shah of Iran in 1979. The Shah had his many flaws, no question about it. But Carter’s actions helped trigger the Islamic Revolution and led to the rise of the Ayatollah Khomeini, the loss of an American ally, and the rise of a terror-exporting country that has gained in lethality ever since. We dare not make the same mistakes with Egypt. I am praying, therefore, that the Lord would be merciful to the people of Egypt, and that He would give wisdom to Mr. Mubarak and his senior advisors. My ideal at this point is that Mubarak would hand the keys to the kingdom to a group of Reformers, men truly committed to steadily expanding hope, growth and opportunity for all their people, and doing so in a way that creates order and stability, not an opening for the Muslim Brotherhood to seize control. This will not be easy. I am not convinced Egypt spymaster-turned-new-Vice President Omar Suleiman is the man to accomplish this. But I know that ultimately the Lord is in charge, and this — and nothing else — is what should give us all hope. Come to Israel with The Joshua Fund in May 2011, walk where Jesus walked, pray for the peace of Jerusalem, visit our warehouse, participate in a humanitarian relief project, worship with fellow believers, study the Word of God, and be a blessing to the nation of Israel at this critical time! Visit The Joshua Fund’s new website — www.joshuafund.net – and make a contribution to help us educate Christians about God’s love for Israel and help us bless the poor and needy in the epicenter in the name of Jesus. National Review Online on Friday posted a series of new columns analyzing the growing protests in the epicenter, including mine: “Revolution in Egypt? And Could Jordan Be Next?” Inside Egypt, the government mostly shut down the Internet Friday, shut down Twitter, and Facebook and other social media, while deploying the army, beating protestors and jailing more than 1,000 people. Meanwhile, Vice President Joe Biden is saying publicly that Egyptian President Hosni Mubarak is not a dictator and should not step down. Tourists beseige Cairo airport trying to get out, but flights halted — British flight en route to Egypt turned around in mid-trip and returns to the U.K.
Intel chief Omar Suleiman appointed Egypt vice-president; Mubarak’s sons flee to U.K. Double-digit inflation — especially “record high” increases in food prices in Egypt last year — fueling public outrage and protests, aside from concerns about government corruption, democracy, etc. Is Egypt about to erupt in a full-blown revolution that could lead to the fall of the Mubarak regime? Might Jordan’s government be next? One thing’s for certain: no one predicted the demonstrations in Egypt would grow so big so fast. Momentum for the protests is growing. A Facebook page promoting the democracy protests grew from 20,000 members on Wednesday to 80,000 on Thursday. The government then reportedly shut down Facebook, and disrupted internet service in parts of the country. Twitter has been blocked. Police are beating protesters. One key factor few are seeing at the moment: economics. Egyptians are suffering double-digit inflation and record food prices in recent years, and particularly in 2010. Most people are already dirt poor. Soaring food prices are causing them to fear they may not be able to feed their families. This is creating a “perfect storm” of anger against the Mubarak regime — it’s corrupt, authoritarian, anti-human rights, and resistant to all positive economic and political reform. It’s been bad for the thirty years Mubarak has been in power. But with high inflation, especially for food, Egyptians are being pushed over the brink. Calls for Mubarak to step down growing. “Mohamed ElBaradei, the former head of the U.N. nuclear watchdog turned Egyptian reform campaigner, said he expected big demonstrations across Egypt on Friday, and that it was time for President Hosni Mubarak to go,” reported Reuters. “ElBaradei, 68, left Vienna, where he lives, for Cairo on Thursday to join a growing wave of protests against Mubarak inspired by Tunisia’s overthrow of their authoritarian president. He told Reuters he would not lead the street rallies, but that his role was ‘to manage the change politically. '” On Friday, however, ElBaradei was placed under house arrest in Egypt. In my 2009 non-fiction book, Inside The Revolution, I described Mubarak as a “classic Resister” — he doesn’t want real change of any kind. He just wants to retain power, keep things stable, keep wealth and power for himself, and pass the keys to the kingdom on to his son, Gamal. But such resistance to positive change is inflaming the “rank-and-file,” every day Egyptians who feel increasingly desperate, and see others in the region (Tunisians, Iraqis, and the people of southern Sudan) as changing their governments and having more say in the affairs of state. They are yearning for something better, and now they’ve taken to the streets in hopes of getting it. Please keep praying for Egypt’s 80 million people — for freedom, for safety, for courage, and for the gospel to be spread to an entire nation desperately needing God’s love and plan for their lives. Pray, too, for the people of Jordan and all the nations of the region as instability rises rapidly. Note: For the past several years, The Joshua Fund has been supporting ministry leaders and projects in Egypt and Jordan to share the gospel, make disciples and strengthen the Church. Please pray these investments would be fruitful, and please help us if you can. On Wednesday morning, Glenn Beck interviewed me on his radio show on Iran, End Times Bible prophecy, The Twelfth Imam, and his new documentary film, Rumors of War, which I helped his team with. Many of you emailed me that you had missed the interview and wanted to find out where you could listen to it. Here is a transcript of our interview. Also, here is an online video of the interview. We’ll hopefully post the audio podcast of it soon. Please go to the “Epicenter Team” page on Facebook to post your comments. One further note: In Glenn’s documentary film, at the end I explain that as a follower of Jesus Christ, I do believe we are living in the last days, based on the teachings of the Bible about what signs to watch for. Among these signs are not only rumors of wars, but major wars themselves, particularly wars waged in the Middle East and specifically against Israel and the Jewish people. As I said on camera, we are to pray for peace, the Bible teaches, but we are also to prepare for war — that is, followers of Jesus Christ are supposed to get ready for the wars that will come by caring for the poor and needy in the region today, and stockpiling food, medical equipment, and other humanitarian relief aid so we can be respond quickly and with Christ’s compassion when rumors of war turn to reality. That’s why we started The Joshua Fund in 2006. Please learn more about what we’re doing — and please get involved — at www.joshuafund.net. GLENN BECK: There are a few people that I have met in my career in the last ten years, and there are just a handful that I think really truly believe what they say, really truly are trying to find the answer and let the chips fall where they may, and are willing to say the insane or dangerous thing because they’ve tried to explain it away and they — no matter what they try to do, it won’t go away. The facts are the facts. Joel Rosenberg is one of those guys. Joel was working for the Israeli government for a while, was an advisor for prime minister, I think it was Benjamin Netanyahu, I can’t remember, and he is a newfound Christian and converted and was really looking into, you know, scriptures. And he was on a plane and he and the prime minister were talking about something and he realized, oh, dear heavens, that’s a sign. And dedicated his life to this because he really truly believes we are living in dangerous times. And I don’t want to put words in his mouth, but the end times? Quite possibly. How long that time lasts is, you know, beyond us. He is also a guy that when I started looking into the twelfth imam and I started to have that conversation with my own research team and I started saying, well, wait a minute, wait a minute, I think this is the exact opposite. This is the bad guy to the Christians. But to the Twelvers in Iran, he’s the good guy. And the story lines match up almost identically to the book of Revelation except it’s the polar opposite. Joel believes some of these things, many of these things, and so do I. And he has dedicated his life to get the word out. Joel Rosenberg is on with us now. Hello, Joel, how are you? ROSENBERG: Good to be with you again, Glenn. How are you? I’m good. GLENN: Very good. You’re the author of The Twelfth Imam and you also have helped us on the Part One of Rumors of War. I’m getting e-mail this morning: Why did you name it Rumors of War, Glenn? Joel, do you want to explain why I named this the documentary Rumors of War? ROSENBERG: I’m just spit-balling here, but I’m thinking it was from Matthew Chapter 24 where when Jesus was asked by his disciples on the Mount of Olives in Jerusalem, hey, when are you coming back? Give us one sign of the end of the age. Jesus didn’t just give him just one sign. He could have given him a very Washington political answer: No comment, next question. But he actually gave a whole list of signs. GLENN: Jesus in press conferences. ROSENBERG: You know, those were only two of the signs. One of them that was — that false Messiahs would come in the last days of which I think the twelfth imam is one. So I appreciate what you’ve done. I can’t think of other national commentators that focus this type of attention not just on end times prophecy alone. That’s important, I think. But the fact that the only regime in modern history that I’m aware of that is being driven right now by an end times theology, a quite dangerous one, would be the government of Iran. Didn’t seem to merit more than a sentence in the State of the Union last night, but this is important and I appreciate you bringing attention to it. GLENN: Joel, I tell you even the Nazis didn’t run their whole regime on end times theology. However, they were fascinated by the occult and fascinated. I mean, Nazi Germany and Iran, Iran is a — was Persia. It was the relationship with the Nazis that made them turn their name to Iran, which is not Arabic. ROSENBERG: It’s actually predates the Nazis. But officially in 1935, but it is an Aryan country ethnically and obviously there is a deep connection there. GLENN: No, it was — but it was suggested by the Nazi advisors or something, if I’m not mistaken. It’s been like a year and a half since I’ve done the research on it. ROSENBERG: Well, the time frame is right, 1935, March. Hitler was certainly rising and the Persian leaders definitely felt a kinship there to Nazi Germany. And there’s no question that President Ahmadinejad now is trying to accomplish what Hitler did then. And if he — you know, we talk about in your new documentary, which I haven’t seen the whole thing. I’ve only seen clips. ROSENBERG: The serious attention of the president. ROSENBERG: That’s true. The difference, though — and obviously you and I have talked about it before is that, you know, a Jeffrey Dahmer isn’t broadcasting his intention. ROSENBERG: The leaders of Iran are. 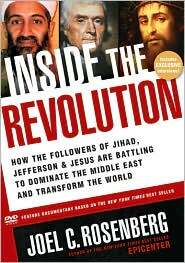 ROSENBERG: — the leaders in Iran — now, this was a fictional version. ROSENBERG: But still they do have a sense that the things that the Iranian leadership are saying, that those guys actually believe it and that there are implications for us, for Israel, for our allies that our government and others aren’t taking as seriously as need be, given the genocide that the Iranian leadership is talking about. GLENN: All right. Well, tonight at 8:00 Eastern time on Insider Extreme, I have been working — I shouldn’t say. I suggested this to my team about a year ago and we worked on it, you know, for — I did for about three weeks at the beginning and then at the end I come in and they have been working on this for a year, and it is a two-part series. The first part is just, here’s what they’re saying. Here’s what they’re doing. Here’s what their own people are saying and doing. Here’s how they’re beating them down in the streets. Here’s the history that you need to understand. Here’s what we’re saying and here’s what they’re actually saying to our face and then behind our back. Not even behind your back. In a different language on their own television networks. Here’s what they’re telling their own people. Here’s what’s happened in the year that we started this documentary, this is how much progress they have made. And the last ten minutes go into what Part 2 is really all about: Why? Why would they do this? It could be just because they want power, just because they want this or that but, umm, no. It’s so much deeper than that. And the comparisons. And we begin to lay these out. Between the book of Revelation and the Antichrist and the earmarks of the Antichrist and what the government would be like and what this government over there is doing and who the twelfth imam is. We don’t know. He hasn’t arrived yet. But they — Ahmadinejad closes all of his speeches, “Oh, a la, give me the strength to hasten the return of the promised one.” And if you do an A/B comparison between the promised one and the Antichrist, they look very, very — Joel, am I saying something that’s not true? ROSENBERG: I think that it’s, in broad strokes it is very true. There are a lot of similarities. You know, one of the questions I got asked in The Twelfth Imam book tour was do you believe biblically from an evangelical Christian perspective that the Twelfth Imam should this person come. We don’t know that he is but Jesus warned a false Messiah, would this be the Antichrist. And I would just say — and I’m not sure we have the time to get into it in detail but I don’t think this is the Antichrist, capital “A.” It certainly would be an antichrist, little “a.” There are some specific reasons for that. GLENN: Let’s look what they’re doing. ROSENBERG: You and I haven’t talked about this in quite some time. There’s obviously a lot of politics going on last year. But last summer, I’m not sure if you’re aware, last summer in July the Ayatollah Khamenei, the supreme leader of Iran said publicly that he had met with the twelfth imam. Now, what was odd about that is that nobody knows what he’s talking about. Is this a person? Is this a vision that he had? A dream? Some sort of spirit? But three weeks later in July of last year he said publicly that he is the official representative of the twelfth imam on Earth and therefore must be obeyed. It was significant in two parts. One, because he now believes this isn’t just a theory that he believes but a reality that’s about to emerge. ROSENBERG: Stepping out in front of Ahmadinejad and saying, yes, Ahmadinejad’s been taking about this but I am now the spokesman. And that was a significant change. GLENN: Okay. Tonight 8:00 p.m. Eastern on Insider Extreme. A new documentary Rumors of War. This one you need to understand. And it’s Part 1. Understand all of the, all of the stuff that is actually going on from the people who are there or working on our side behind the scenes to stop Iran. What is happening? And then Part 2, the Twelfth Imam. That’s tonight at 8:00 p.m. Thanks a lot, Joel, best of luck. GLENN: Best of luck. Bye-bye. ROSENBERG: Good to talk to you. 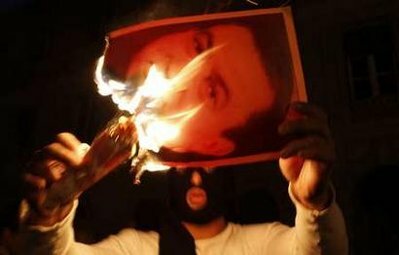 PRO-DEMOCRACY, ANTI-MUBARAK PROTESTS INTENSIFY IN EGYPT; UNCONFIRMED REPORT THAT MUBARAK’S SON AND FAMILY HAVE LEFT THE COUNTRY: Please pray for Egypt’s 80 million people. Something is happening in Egypt we need to watch carefully and pray about seriously. The sudden, unexpected popular overthrow of a corrupt, authoritarian regime in the North African country of Tunisia this month — a Reformer movement fueled by Facebook and Twitter — is having ripple effects in nearby Egypt. Mass protests against President Hosni Mubarak, 82, his authoritarian regime, government corruption, poverty, and human rights abuses ignited yesterday in Cairo, Alexandria and elsewhere, and intensified today. The numbers of Egyptians turning up for the protests, many of them hearing about the events through social media, are swelling into the tens of thousands, and possibly higher. 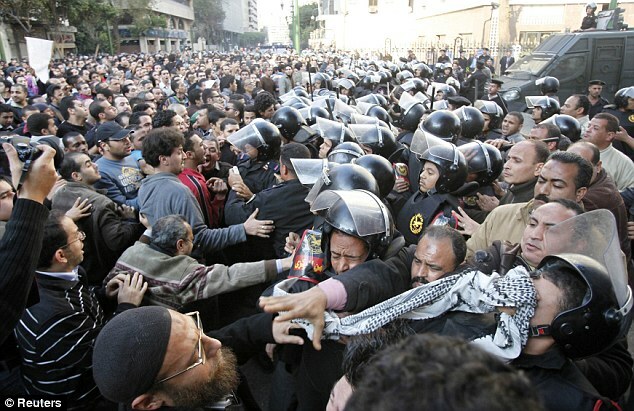 Egyptian police are clashing hard with the protestors. Injuries are mounting and there have been a few deaths. ﻿Is a revolution in motion? 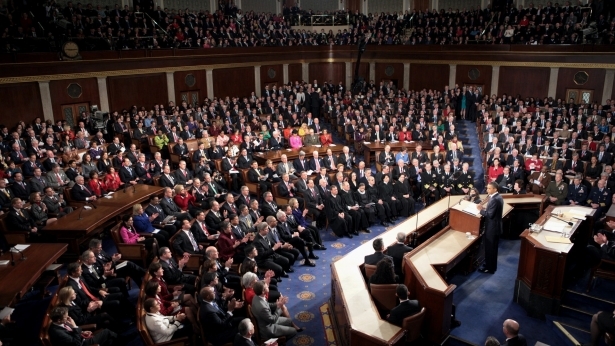 Are pro-democracy Reformers likely to succeed? Not according to the Obama administration. “Our assessment is that the Egyptian government is stable and is looking for ways to respond to the legitimate needs and interests of the Egyptian people,” says Secretary of State Hillary Clinton, masking a view widely held within the U.S. government that the overthrow of the Mubarak regime could be a massively destabilizing event in the Middle East. Personally, I don’t think the Mubarak regime is stable at all. It is an authoritarian, corrupt, anti-human rights, anti-free speech regime. The Egyptian people deserve much better. They deserve freedom and democracy. They certainly don’t deserved to be beaten and tortured for protesting Mubarak’s many sins. In my non-fiction book, Inside The Revolution, I wrote: “President Hosni Mubarak of Egypt — nominally a Muslim but more of a secular Arab nationalist at heart — is a classic Resister…. [and] has resisted fundamental changes in Egypt of almost any kind” ever since coming to office after the death of President Anwar Sadat, one of the great Reformers of history. There is an unconfirmed report that the Egyptian leader’s son, Gamal Mubarak (widely believed to be his father’s choice to succeed him), and Gamal’s family, have left the country, possibly for England. We’ll see if that’s true or not soon enough. Pray that the Lord will have mercy on the 80 million people of that important, proud, historic country. Pray that the people of Egypt will find freedom and democracy and that honorable leaders will emerge to replace the Mubaraks. Pray that the Reformers are successful, with a minimum of violence. Please pray that the persecuted Church in Egypt will be strong, courageous and healthy and will share the good news of salvation through Christ to the entire nation at this critical time. Pray that many Muslims will come to faith in Jesus Christ. Pray that there will be a revival among the 10% of the nation that are Coptic Christians, many of whom are nominal Christians — pray that they find a real and personal relationship with our Lord Jesus. Pray for believers outside Egypt to know how best to help, as the Lord leads. The latest Reuters headline reads: Egyptians rage against Mubarak’s 30-year rule. Breaking news story out of Israel….and a huge answer to prayer….Israelis arrest 13 suspected terrorists….news reports say some of them have confessed to the murder of Kristine Luken and the vicious stabbing of Kaye Wilson….click here for details on The Joshua Fund’s website. >> I’m scheduled to be on Glenn Beck’s radio show at 11:30am eastern this morning to discuss Iran and The Twelfth Imam. You can listen live online at www.glennbeck.com. On Wednesday morning at 11:30am eastern, I will be a guest on Glenn Beck’s radio show to discuss an original documentary film, Rumors of War, that Glenn will launch on Wednesday night. 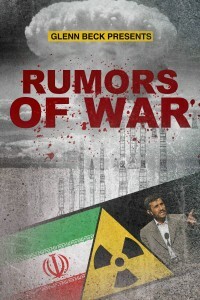 The one-hour film, whose trailer is now posted on Beck’s website, examines the Iran nuclear threat to the United States, Israel and the world, and the Shia Islamic eschatology held by the Ayatollah Khamenei and President Ahmadinejad that is currently driving Iranian foreign policy. I was interviewed for the project last year as I was writing The Twelfth Imam. While I’ve only seen a few clips of the project so far, I’m looking forward to it. After all, what other national figure is putting a spotlight on the End Times views of Iran’s leaders? UPDATED REPORT (12:30pm eastern): “An explosion ripped through the international arrivals hall at Moscow’s busiest airport on Monday, killing 35 people and wounding about 130, officials said. The Russian president called it a terror attack,” reported Time magazine. FIRST REPORT: “Moscow’s Domodedovo airport — the busiest in the Russian capital — has been rocked by an explosion that has killed at least 10 people,” reports the BBC. “Dozens more are thought to have been injured in the blast, which reports suggest may have been the work of a suicide bomber.” More details. Please pray for the victims and their families at this critical moment.